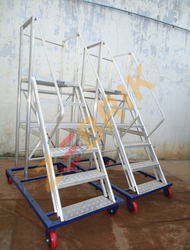 We are a leading Manufacturer of mobile step ladder, trolley step ladders, outdoor support extension ladder, monkey ladder, emergency ladder and self support telescopic ladder - mounted on small wheel from Chennai, India. 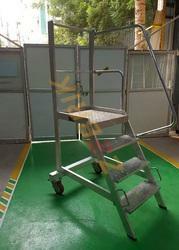 High quality polymer wheels mounted on a ms trolley along with brake. 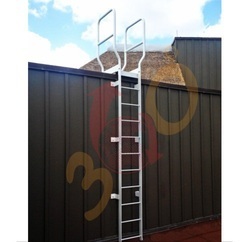 We maintain quality in our entire product range including Outdoor Support Extension Ladder. The offered range is available in various specifications which best suit the exact demand of our clients. 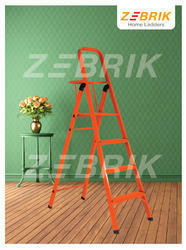 Our Outdoor Support Extension Ladder is highly appreciated in the market for their salient attributes. They are developed using high grade of raw material in highly advanced technological advanced skills. We assure our clients that our products will give trouble free long service to the user. • Main Extrusion made up of Aluminium alloy 'C' Section 66 x 32 x 3.18mm thickness of Aluminium made of HE 30 grade T6 temper HINDALCO make. • Steps made up of 26mm x 3 mm thickness Non slip, extra grip round corrugated flutted Pipe steps. 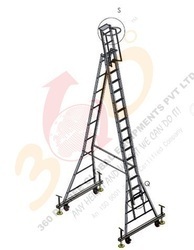 360 Degree Self Supporting Telescopic Ladder Mounted on small wheels 20" to 36", 20" to 50"
Main Extrusion made up of Aluminium alloy "C" Section 66 x 32 x 3.18mm thickness of Aluminium made of HE 30 grade T6 temper HINDALCO make. Our organization has successfully expanded its business in market owing to the offered elevated quality range of Medium Duty Aluminium Scaffolding. 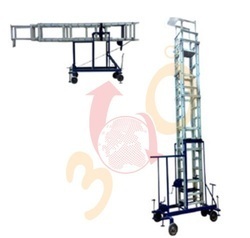 The Scaffolding from 360 Degree Global is manufactured with aluminum as the key ingredient. 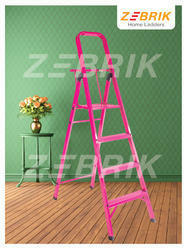 Staircase Ladder is also known as Step Or Stage Ladder. 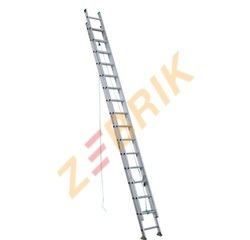 Owing to the features like lightweight and versatility, the Aluminium Wall Extension Ladder is extensively used at various shops and homes. 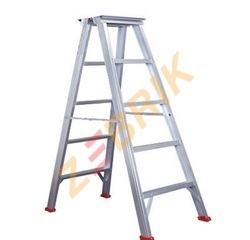 The Aluminium Wall Extension Ladder, we offer, is made using quality aluminum that assures high load bearing capacity and longer service life. 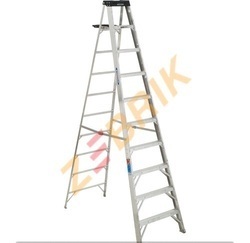 The clients can avail the Aluminium Wall Extension Ladder from us at the market leading price. 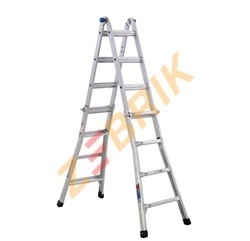 Step to step distance: 12"
Being a prominent manufacturer and supplier of Self Supporting Extension Ladders in India, we fabricated these products using high-grade aluminum and rubbers procured from trusted vendors to ensure optimum quality output product. Sizes Available : 260 Cm long, 360 Cm long, 470 Cm long., 570 Cm Long, 670 Cm Long. See "amaze" catalogue. 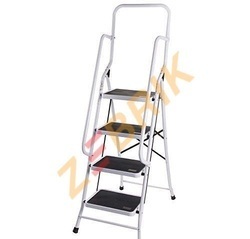 Price includes supply of a horizontal foot board set for standing on a platform. 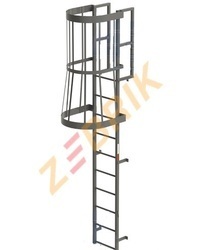 Aluminium alloy heavy duty box tiltable tower extension ladder, mounted on 4 nos special type solid rubber tyre 12” x3 ½” size wheeler ms channel trolley, provided with top working platform of size: 18” x 22”, tools tray of size: 18” x 10” -2 nos, gear winch 1 no for extension lowering purpose and another 1 no for tilting purpose, 4nos screw type ground lock and tow bar handle. 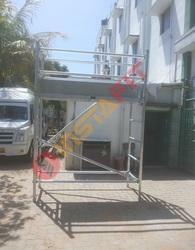 We are providing our clients with a comprehensive range of Aluminum Telescopic Ladder. 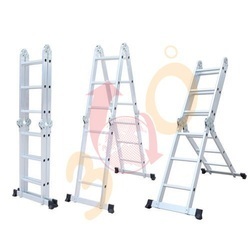 Made using supreme quality raw material, the offered Aluminum Telescopic Ladders satisfy the requirements of clients. Furthermore our offered products that we offer are checked on various quality parameters by a team of experienced and skilled professionals so as to deliver a flawless range of products. 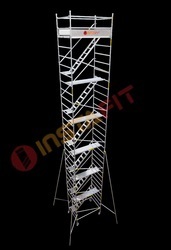 Being a quality conscious firm, we are presenting a quality assured assortment of Warehouse Mobile Platform Ladders. 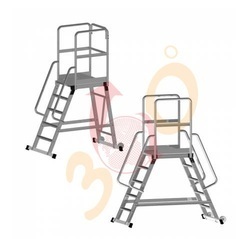 The Warehouse Mobile Platform Ladders are recommended for their hassle free performance. Easy to install these products are known for their reliability. 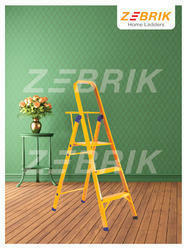 Looking for Step Ladders ?